When it comes down to it, we all like to be appreciated for our accomplishments at work. Employees the world over want their efforts to be noticed, their performance and the results it creates to be rewarded and key milestones in their career celebrated. Even so, while basic human similarities outweigh our differences by far, there are subtle cultural nuances from country to country. Recognising someone in France? Say thanks face-to-face. 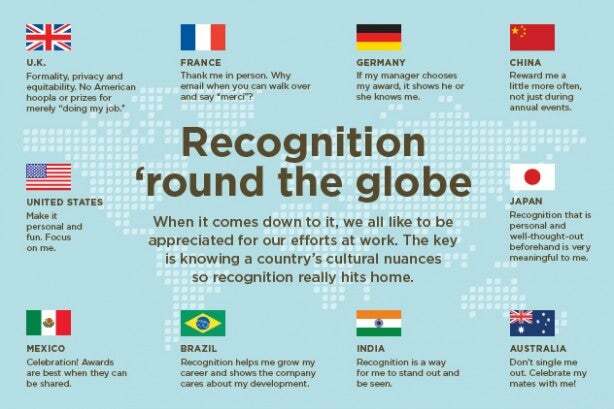 In India, China and Mexico, make sure employees are recognised in front of leaders. And in Brazil, the best employee rewards are those that further an employee’s career. Learn more in this month’s webinar recap Global recognition: It’s easier than you think, or download the webinar recording to gain more insights. When it comes to creating an effective global employee recognition program, knowing what’s culturally appropriate can make a big difference. All the difference in the world.